SAN FRANCISCO — After many years of anticipation and in an attempt to expand its offerings of fitness classes, the Japanese Cultural and Community Center of Northern California is inviting the public to its first free Zumba workshop. On Sunday, May 20, from 10 a.m. to 12 p.m. at the JCCCNC, 1840 Sutter St. in San Francisco Japantown, participants will experience the Latin dance-inspired fitness craze that has swept the nation, giving students of all fitness levels a fun and exhilarating workout towards a healthier lifestyle. Noriko Rovner (foreground) at last year's Spirit of Japantown Festival in San Jose. Zumba instructor Noriko Rovner, who has had over 20 years of experience in dance and has taught Zumba classes in San Jose’s Japantown, will lead the energy-packed workout. Her energy for Zumba is infectious. “My Zumba fitness party can bring people together with lots of fun and smiles — it’s more than just a fitness workout,” she says. “It’s about fun with a party-like atmosphere with energetic Latin music, and anyone can do it. Hello! Great article! Noriko will make everyone happy at JCCCNC by getting them moving to the rhythms of Zumba and Zumba Gold. There’s just one thing. 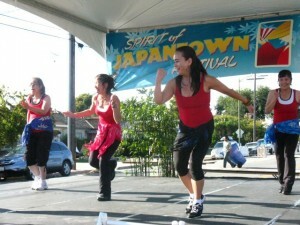 The photo is of a performance of VivAsia (www.vivasiafitness.com) at the Spirit of Japantown last year! It’s not Zumba – it’s dance fitness that has classes for all age levels (i.e., in additiona – VivAsia Dragon for children, VivAsia Lotus for seniors). This dance fitness uses Asian music, traditional props (tenugui, fans, ribbons) from Asian countries re-created in fitness style. It uses Asian pop music too and is spreading through Northern California. Creator, Ying Mitchell, got back to her roots having taught just about every sport fitness type of class there is! She currently is on her second masters degree, this time in kinesiology while teaching Body Sculpting at San Jose State University, Zumba, VivAsia and many others in the Bay Area! Noriko is one of the VivAsia teachers and teaches a VivAsia class in San Jose Japantown as well at Akiyama Wellness Center on Thursday mornings! Just wanted to be clear about the photo! And give credit where credit is due.